The more efficiently you can move your body, the more effective you will be in a fight. Staying, or getting, physically fit is important on many different levels for the average person, but especially so for someone who carries a firearm for self-defense. A well-conditioned body increases muscle control for better accuracy and recoil management, increasing the speed of follow up shots. Not to mention the psychological benefit of stress reduction both in day-to-day life and after a traumatic event like self-defense. Yes, making a habit of getting sweaty a few days a week is one of the best, if not the best, thing you can do for your self-defense preparedness. Of course, you already know that. That’s why you’re here. But your gym clothes aren’t working with your normal CCW holster. And you’re still trying to stick to the commitment you’ve made of carrying your pistol wherever you go (plus, the only jogging path near your house looks like a scene out of a horror movie in the dark hours of the morning). Every gym rat I know works out in a different way. Powerlifters, cross-fit, swimmers, runners, etc. Exercise can be as diverse as the person, so not all these carry options may work for you. Even after choosing one that looks best, you may decide that it's not cutting it for you after a time . Finding the right way to carry concealed at the gym may take some experimentation, but hopefully these options will help narrow the search. This is currently my favorite way to carry. Since the holster has its own belt it doesn’t rely on the kind of pants you are wearing, like a Kydex holster with belt clips might. The holster easily accommodates most sizes of handguns and includes an additional pouch for a spare magazine. I can vouch for the holster's durability as I’ve worn it all day, every day for the last 7 months and, while it looks well used, there are no signs of popped seams or loose stitching. The reason I’ve been able to wear this holster for such a long period of time is because of how comfortable it is. The phrase “I forget that it’s there” sometimes gets thrown around recklessly, but I feel it applies here. The versatility of the Brave Response Appendix Holster with clothing far exceeds traditional holsters. No matter what you wear, from dress slacks and sun dresses to basketball shorts and yoga pants, the holster works. The high degree of adjustability in the attached hook-and-loop belt means that you won’t have to buy a new holster when you start seeing those gains in the gym and your waist size changes. One potential detractor of this holster is that it will not fit a weapon with a mounted light. If you are like me and feel it is important to carry a light with your self-defense weapon, you can carry an EDC flashlight in the extra pouch instead of a spare magazine like I do. Yes, the fanny pack is one of those iconic images of the 80’s that has fallen out of fashion with most of modern culture. But this might be one of the best ways for you to carry concealed when working out. I like to carry this way when I lift weights because it gives me a place to put my other gym essentials like my Jeep keys, phone, and lifting chalk. Runners can throw in a small can of mace for unfriendly dogs. There are some who might say that a fanny pack is a freely waving “I have a gun” flag. 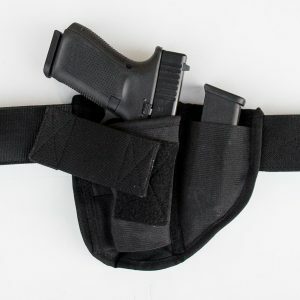 But as there are few people these days who carry concealed in a fanny pack, as compared to other more traditional holsters, the risk is relatively low. 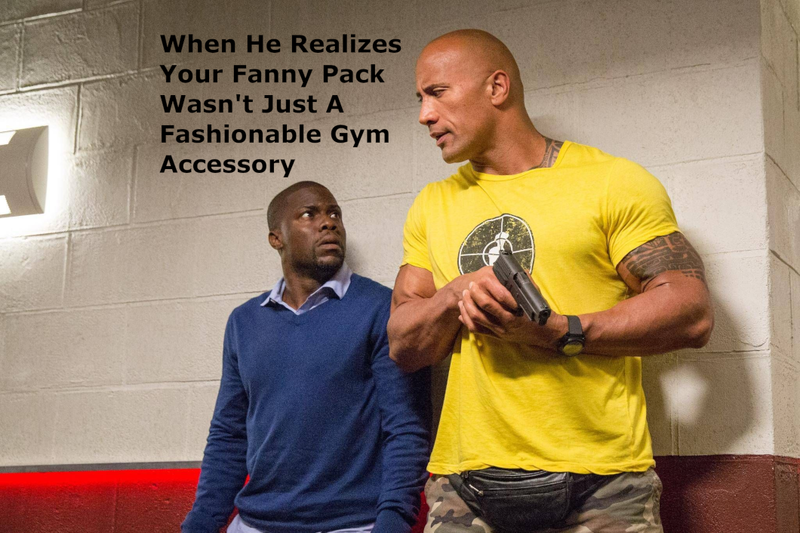 And fanny packs are not the most unusual items to see on the trail or in the gym. So, if you don’t mind looking like a dork, the fanny pack might be the carry option for you. And hey, if The Rock can pull it off, you can too … right? I know a number of people who like to carry in a small backpack or gym bag, and I’ve carried this way at the gym as well. But it’s one of my least favorite ways to carry there. The constant feeling that someone might walk away with the bag when I am deep into my final set can be distracting. Read here for some of the other potential drawbacks of Off Body Carry. You’ll get no raised eyebrows from me if you decide to carry in a bag instead of on your body. I think it’s fine as long as you understand the potential risks and train to mitigate them. Concealed carry leggings are fairly new to the market and offer women (who don’t normally have a lot of CCW clothing options) a way to carry their pistol in a secure and comfortable way. I can’t speak to the value of these leggings as they don’t currently produce a size that will fit my 6’2, 250 lbs. frame, but this looks to be a potential solution to the problem women face while carrying concealed. The by-women-for-women product helps address issues of form, fit, and function for female shooters which is often overlooked in an industry tailored to a primarily male population. I find carrying a Kydex holster in basketball or PT shorts uncomfortable because the single tie string and elastic band are not a stable enough platform for the holster, which tends to flop around awkwardly every time you move. And, depending on the pistol you’re trying to hide, your pants might not even stay up. 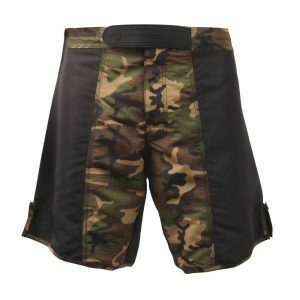 MMA shorts, however, are different than many other types of athletic shorts in that they tend to have a kind of cummerbund waist that can be tied in place. This provides a wider base to attach the holster clips to. The security provided over the single tie string of basketball shorts is significant and allows for a Kydex holster to be comfortably carried. I like to carry this way in the summer at picnics and firework displays. The Ulti-Clip came out onto the market a few years ago and has since become a mainstay on many concealed carry holsters. The metal attachment functions unlike any other holster clip, as it works in a similar fashion to the clips on suspenders. A throw lever activates the locking mechanism of the clip, pinching it tightly to the pants or belt. The hold of the Ulti-Clip impressively exceeds 50 lbs. of pulling force and is a great way to secure a holster to pants or shorts. For options on a few guns that would be great for gym carry, check out this article on the Top 5 Back Up Guns. While meant for backup guns, they serve double duty as great gym guns. Although you can carry any size firearm you wish, the smaller the gun the easier it will be to conceal and keep in place with movement. Something that might surprise you after a few weeks of carrying at the gym is that your pistol has seemed to develop a nasty rust infection. Sweat is a natural enemy of your pistol, so regular maintenance and an extra coat of oil will help keep it up and running malfunction free when you need it most. Have you tried any of these methods of carry? What did you think? Share your favorite way to carry at the gym down below.